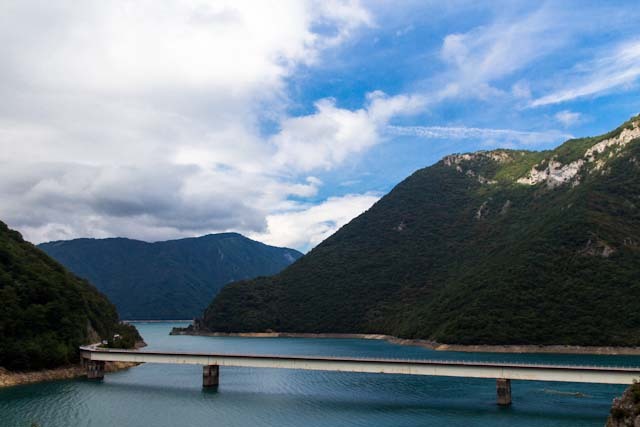 The Piva river is located between Montenegro and Bosnia and Herzegovina, shorter headwater of the Drina river, which it forms with the Tara river on the border with Bosnia and Herzegovina. The Piva springs from the Sinjac spring on Golija mountain, near the Piva monastery also called Vrelo Pive (Well of Piva). 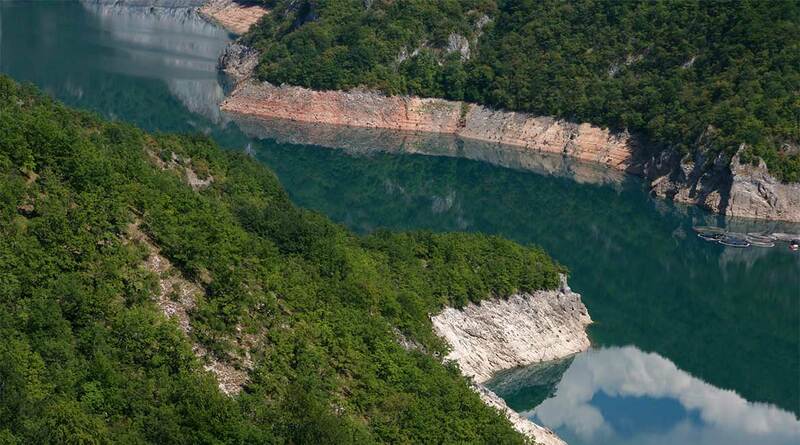 Before the artificial Pivsko Jezero lake was formed, the water from the well rushed into the river Komarnica thus creating the Piva river for the next 34 kilometer. However, Komarnica is part of a 86 kilometer long river system (Tušina–Bukovica–Bijela–Komarnica), so measured from the source of the Tušina river, the Piva, nicknamed ‘the river with five names’, is 120 kilometer long. The Tušina originates from the mountain Sinjajevina in the Uskoci region of central Montenegro, just few kilometers away from the source of another important Montenegrin river, Morača. The river flows to the west, between the Sinjajevina and Lola mountains, next to the villages of Krnja Jela, Bare, Boan and Tušina. It receives from the north the Bukovica river, and continues further under this name. After the river passes the regional center of Šavnik and the villages of Gradac and Pridvorica in the region of Drobnjaci, the stream receives from the north the Komarnica and takes its name. The Komarnica continues between the mountains of Vojnik and Treskavac, in an almost uninhabited area and enters the high Piva plateau, where it turns north, almost all of the Komarnica’s course is flooded by the reservoir of the Pivsko Jezero, receives from the right outflow of the Piva spring and enters the deep Piva canyon. The Piva ravine is located in the Plužine municipality. The same named city of Plužine lies in the middle of the flow of the Piva River, and is the only major place in this region. Plužine is beautifully situated on the banks of the Pivsko Jezero lake in the wider part of the ravine. Guesthouse Gostionica Pluzine – This property is 6 minutes walk from the beach. Set in Plužine, Guesthouse Gostionica Pluzine offers free WiFi. All rooms feature a flat-screen TV with satellite channels and a private bathroom. The guest house provides a local restaurant. At the guest house, rooms have a patio. Some rooms are fitted with a kitchen with a dishwasher and a fridge. All rooms at Guesthouse Gostionica Pluzine are fitted with a seating area. A continental or American breakfast is available each morning at the property. The accommodation offers a terrace. Guests at Guesthouse Gostionica Pluzine will be able to enjoy activities in and around Plužine, like cycling. Faciliteiten : Free Wi-Fi Internet, Free Parking, Terrace, Hot tub/jacuzzi, Restaurant (à la carte, On-site coffee house, Bar, Luggage storage, Shuttle service (additional charge), Meeting/banquet facilities, Horse riding (Additional charge), Hiking (Additional charge), Fishing (Additional charge). Apartman Bujisic – This property is 3 minutes walk from the beach. Situated in Plužine in the Pluzine County region, Apartman Bujišić features a terrace. Guests staying at this apartment have access to a balcony. This apartment with mountain views has 1 bedroom and a bathroom with a bath. There is a seating area and a kitchen complete with an oven, a microwave and a toaster. The apartment offers a terrace. Cycling can be enjoyed nearby. Facilities : Free Wi-Fi, Free parking, Balcony, Terrace, Mountain view, Lake view, Ironing Facilities, Airport shuttle (additional charge), Daily maid service.